Norsafe has carried out extensive research and development in the last few years to develop a new range of robust and safe boats for the military and professional market. Using its experience as a high-tech composite engineering company, Norsafe has been responsible for developing and manufacturing some of the most robust rescue and freefall lifeboats, for use in extreme weather conditions, on the market today. 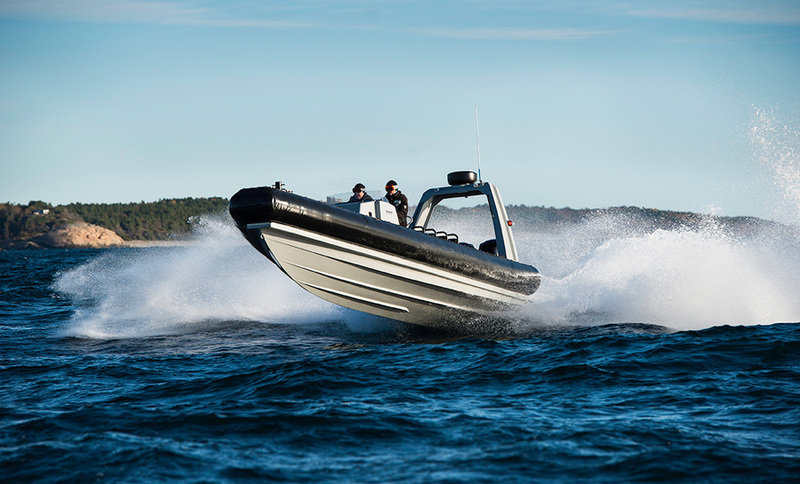 The latest boat to hit the water this autumn in Arendal, Norway, is the Marathon 900 RHIB-D. Based on the well-proven Marathon 900 RHIB concept, Norsafe has developed a new generation multi-mission high speed craft. Its rigid bulwarks and D-fender configuration means the available deck space has been increased and the deck layout with cargo track configurations makes the layout flexible and optimized for user specific configurations. Ergonomics and safety in extreme conditions have been key factors in the design and development of the console and dashboard arrangement. All main controls and switches are within direct reach of the pilot position. All the detailing and functional solutions have been refined throughout the vessel with input from user workshops and long range offshore testing. Furthermore, the console has been designed with large flat surfaces making it easy to install additional mission specific equipment. The navigational lights have been positioned so that they do not create a reflection or light up the vessel during night operations. The robust radar arch has been produced with high-tech woven GRP mats reducing vibration and damage to electronic sensors and equipment mounted on a large flexible mounting surface. With this structure, the vessel can also be delivered with self-righting capabilities. Crew and passengers can be seated using either shock absorbing seats or high-end saddle seats with laminated foam-core seating. The seating can be customized to a client’s specification. Both seats and saddles are fitted to cargo-rails making reconfigurations and optional layouts fast and easy to implement. Moving around the Marathon 900 RHIB-D is helped with grab-rails, robust anti-skid surfaces in step zones and ample work lights when needed. Furthermore, the main deck is flush and without steps, making it safer and easier to move around at night. Large open scuppers on both sides of the stern make the cockpit effectively self-draining. Two mooring fittings are located astern, foldable cleats midship, with two more cleats and a robust Samson post located at the bow. Functional steps and storage boxes both sides of front deck have room for mooring lines. 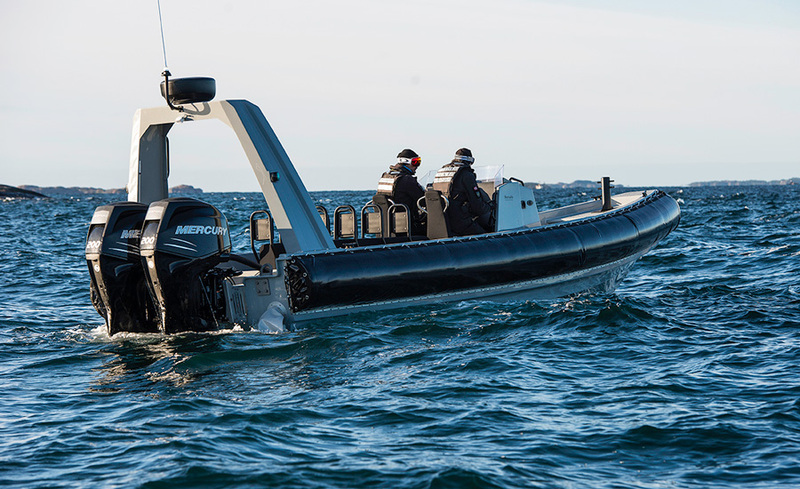 The new Marathon 900 RHIB-D has undergone a number of tests performing well in all rough weather conditions during the autumn in Norway. Norsafe Group has its headquarters in Arendal, Norway. Since 1903, Norsafe has produced nearly 29,000 boats. The company has a worldwide involvement that includes production, sales, delivery and service of lifesaving equipment for ships and the offshore industry. Over the past 25 years, Norsafe has supplied rescue boats, patrol boats and specialised boats for the military and professional markets, with deliveries to police, coast guard, navy, customs, SAR operation and the marine and offshore industries. Norsafe owns production and sales/service companies in Norway, China, Greece, Mexico, Singapore, South Korea, USA, Japan, Brazil, Australia, the Netherlands, the United Arab Emirates and UK. In addition, Norsafe Group has a network of 45 authorised service partners spread across all continents, operating from 300 ports worldwide. The company is a complete provider within maritime safety, also offering courses and training through Norsafe Academy, with state-of-the-art training facilities at the Port of Lavrion in Greece and in Rosendal in Norway.